Winners of the 2017 Keep Delaware County Beautiful awards were honored Dec. 6 at Berlin Township Hall. 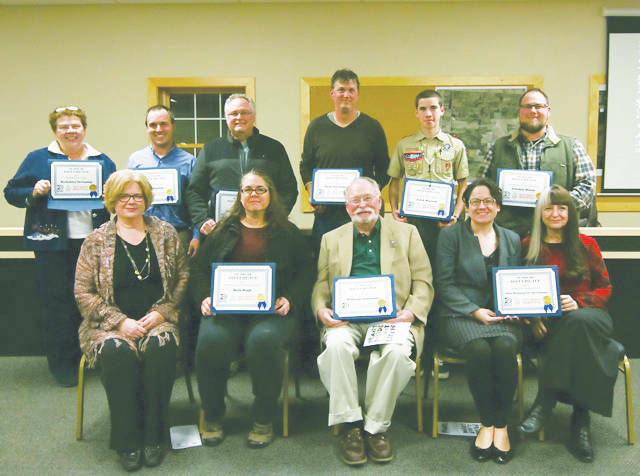 Several community members, leaders, schools and groups received recognition at the annual Keep Delaware County Beautiful Awards that occurred on Dec. 6 at Berlin Township Hall. The Recycling Award recognized Orange Township for organizing special recycling drop-off events for their community. On Earth Day, an electronics drop-off event was held at Home Depot where residents recycled 24,777 pounds — almost 12 and a half tons — of electronics that day. Orange Township was also instrumental in working with Home Depot to set up a permanent electronics drop-off location. In addition, Orange Township held a paper shredding event in August and collected and recycled 2,500 pounds of documents. The Business Award went to Home Depot in Lewis Center for serving as the site for the Orange Township recycling drop-off event. In addition, Home Depot has agreed to serve as a much needed, convenient and permanent electronics drop-off location for Delaware County residents. The Environmental Educator Award went to Beth Hugh, the Maintenance and Park Director for Orange Township. She works hard to engage both youth and adults in the outdoors to increase their knowledge and respect for the environment. She actively pursues opportunities for local schools to bring youth to township parks and has coordinated several storm drain labeling events in the township. Hugh spends many hours trying hard to maintain water quality in neighborhood ponds and storm water basins so residents are content and water quality is recognized. The Beautification Award went to Berkshire Township for developing a community park. The township also partnered with United Way of Delaware County to install a Born Learning Trail and. Volunteers also planted a pollinator garden and artwork has been designed and installed by Big Walnut art students. The Community Stewardship Award, which recognizes individuals and groups for their effort in improving the environment of their neighborhood or community, went to the Friction Metals, a scrap metal recycler in Delaware. Friction Metals assisted Keep Delaware County Beautiful when a place was needed to take materials for the Senior Citizen Appliance and Electronics Pick Up. This year, 91 senior households were served. The Litter Prevention Award recognized Ohio Wesleyan UC 160 classes for helping the Scioto River Valley Federation and Keep Delaware County Beautiful clean up the Scioto River. This year, volunteers pulled 14 tires from the river and another 1,500 pounds of trash, and over the last several years, more than 100 tires and one and a half tons of trash has been removed through the courses service project. Groups like Ohio Wesleyan’s UC 160 classes make events like the Scioto River Sweep a success. The Garrison-Brown Award, named after Charlotte Garrison and Janet Brown who by their own initiative formed a planning committee to beautify the village of Ashley. This award is given to recognize initiative and significant environmental contribution to the community. This year, the award went to Chris Roshon, Gabe Van Gundy and Rick Van Gundy for volunteering their time to haul canoes for the Scioto River Sweep. These men pick up trailers of canoes for river sweep volunteers and load and unload the canoes from the trailers. They also help get the trash in the dumpster and return the canoes. It is hard work and KDCB is grateful they volunteer to help with this event. The Going Green Award went to Mike Williams of Williams Insurance for installing 42 solar panels on the roof of his business on Pennsylvania Avenue in Delaware. The panels were turned on the end of April 2017. KDCB is excited for such a positive example to be set for other small businesses in our community. The Environmental Youth Leadership Award recognized Caleb Warrick for his Eagle Scout Project that included organizing a group of fellow scouts to construct a chimney swift tower at Stratford Ecological Preserve. Chimney Swifts are a type of small bird that eat about one-third of their body weight in insects daily. Historically, these little birds have nested in hollow trees and masonry chimneys. Unfortunately, nesting sites are diminishing as our community develops, or the birds are being shut out of existing chimneys. The beautiful, new Chimney Swift Tower at Stratford Ecological Preserve will provide a new roosting site for birds in the Delaware City and Delaware Township area. Led by the Delaware General Health District, the Keep Delaware County Beautiful coalition provides recycling and litter prevention programs and environmental education activities to the residents and businesses of Delaware County.